Washington, D.C., formally the District of Columbia and commonly referred to as Washington, "the District", or simply D.C., is the capital of the United States, founded on July 16, 1790. 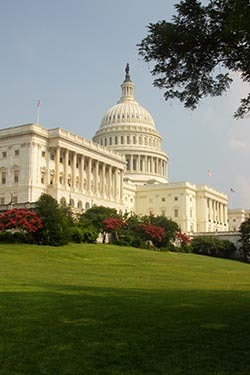 The U.S. Constitution allows for the creation of a special district to serve as the permanent national capital. The District is therefore not a part of any U.S. State and is instead directly overseen by the federal government. That D.C. is not part of any State ensures that the working at the Capitol is not biased to any of the 50 States in the US. Furthermore, the formation of the Upper and the Lower House ensures that every State, irrespective of their size or population have a say. While the population determines the number of elected representatives (435 at the time of writing); 2 senators (100 at the time of writing) represent each State. The President is supreme and is elected directly by the people. Terms for the President and the Senators are 4 & 6 (2 x 3 rotations) years respectively. The country has had 44 Presidents till date. I was part of the Mauiva Aircruise tour. We departed Harrisburg, Pennsylvania by a charter plane to arrive at Dulles International Airport, Washington, D.C. at about 12 noon. A bus was waiting for us right at the doors of the aircraft. In minutes we were ready to explore the country’s capital. Our first stop was Union Station. Well, the location is not only a major transportation hub but is also a great place to shop and eat. The gallery within has many branded stores and the food court out there is amongst the largest in the city. That’s where I had my lunch. Union Station is the main train station in Washington, D.C., and handles approximately 70,000 people each day. It is Amtrak's second-busiest station with 4.6 million passengers annually and serves as the southern terminus for the Northeast Corridor and Acela Express routes. 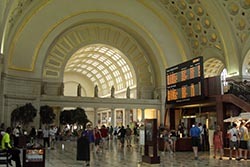 Maryland's MARC and Virginia's VRE commuter trains and the Metrorail Red Line also provide service into Union Station. Intercity bus service is provided by Greyhound, Peter Pan, BoltBus, Megabus, and many other Chinatown bus lines. Our group was booked for a tour of the Capitol. At 3 PM we were at the doors. After passing through security, we were issued tickets that entitled us to see the screening of a film and a guided tour of the Capitol. Be warned that during holidays crowds can get really big. Be prepared to wait for your turn. However, the wait should not bother you because the Visitor Centre is quite roomy and comfortable. The Capitol has a long history in art of the United States, beginning in 1856 with Italian / Greek American artist Constantino Brumidi and his murals in the hallways of the first floor of the Senate side of the Capitol. The murals, known as the Brumidi Corridors, reflect great moments and people in United States history. Among the original works are those depicting Benjamin Franklin, John Fitch and Robert Fulton. Brumidi also worked within the Rotunda. 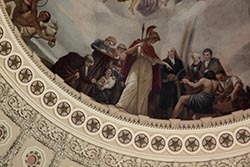 He is responsible for the painting of The Apotheosis of Washington beneath the top of the dome, and also the famous Frieze of United States History. The Apotheosis of Washington was completed in 11 months and painted by Brumidi while suspended nearly 180 feet in the air. It is said to be the first attempt by the United States to deify a founding father. Capitol's National Statuary Hall Collection, comprises of two statues donated by each of the fifty States to honour persons notable in their histories. The State has the option to select the persons as long as the person is dead and the statue is made of marble or bronze. There are 8 original oil-on-canvas artworks that hang on the walls each depicting a story of the American history. By the time we came out of the Capitol it was almost 5PM. Time to visit the Korean War Memorial; Vietnam Veterans Memorial and Lincoln Memorial all adjacent to each other in an area known as National Mall that’s about 30 minutes drive from the Capitol. The Korean War Memorial is in the form of a triangle intersecting a circle. The wall is 8 inches thick made from "Academy Black" granite and is 164 feet long. On this wall are sandblasted more than 2,500 photographic, archival images representing the land, sea and air troops who supported those who fought in the war. The Column stands within the walled triangle. 19 stainless steel statues designed by Frank Gaylord, each larger than life-size, between 7 feet 3 inches and 7 feet 6 inches tall; each weighs nearly 1,000 pounds. The figures represent a squad on patrol, drawn from each branch of the armed forces; fourteen of the figures are from the U.S. Army, three are from the Marine Corps, one is a Navy Corpsman, and one is an Air Force Forward Air Observer. 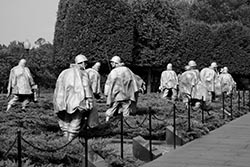 They are dressed in full combat gear, dispersed among strips of granite and juniper bushes which represent the rugged terrain of Korea. The Vietnam Veterans Memorial is a national memorial in Washington, D.C. It honors U.S. service members of the U.S. armed forces who fought in the Vietnam War, service members who died in service in Vietnam / South East Asia, and those service members who were unaccounted for (Missing In Action) during the War. Its construction and related issues have been the source of controversies, some of which have resulted in additions to the memorial complex. The memorial currently consists of three separate parts: the Three Soldiers statue, the Vietnam Women's Memorial, and the Vietnam Veterans Memorial Wall, which is the best-known part of the memorial. The Memorial Wall, designed by Maya Lin, is made up of two gabbros walls 246 feet 9 inches long. The walls are sunk into the ground, with the earth behind them. At the highest tip they are 10.1 feet high, and they taper to a height of eight inches at their extremities. There are 58,175 names etched on the wall. 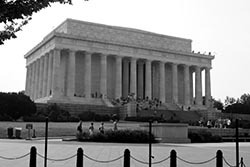 The Lincoln Memorial is an American memorial built to honor the 16th President of the United States, Abraham Lincoln. The architect was Henry Bacon, the sculptor of the main statue (Abraham Lincoln, 1920) was Daniel Chester French, and the painter of the interior murals was Jules Guerin. It is one of several monuments built to honour an American president. The building is in the form of a Greek Doric temple with 36 pillars – one for each of the 36 States of US at the time of Lincoln’s death. 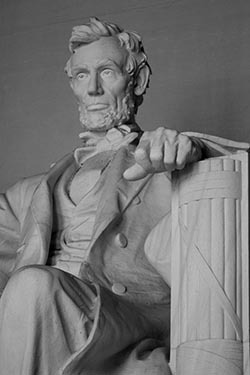 The temple contains a large seated sculpture of Abraham Lincoln and inscriptions of two well-known speeches by Lincoln, The Gettysburg Address and his Second Inaugural Address. The memorial has been the site of many famous speeches, including Martin Luther King's "I Have a Dream" speech. From the Lincoln Memorial one gets a very good view of the Reflecting Pool (it was under renovation at the time of my visit) and Washington Monument. The Washington Monument is an obelisk near the west end of the National Mall in Washington, D.C., built to commemorate the first U.S. president, General George Washington. 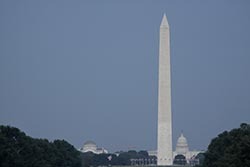 The monument made of marble, granite, and bluestone gneiss, is both the world's tallest stone structure and the world's tallest obelisk, standing 555 feet tall. Visitors can go up to the top. However, long lines deprived me of the opportunity. I believe the view from up there would be simply outstanding… with the Capitol, the White House, the Lincoln Memorial and the Jefferson Memorial on each of its sides. It was late in the evening. Time for us to check in at hotel for the night – Washington Hilton in downtown – a huge property with over 1200 rooms. Dinner that night was at Boca, an Italian restaurant just a block away from the hotel. The food was delicious and the décor fascinating – with framed pictures of Italy and its people taking away every inch on the wall. Half of the next day we would be spending in the State of Virginia visiting Mount Vernon. I have covered this location separately. In the afternoon we would spend time (or should I say get lost) visiting few of the many museums in the capital and the White House. 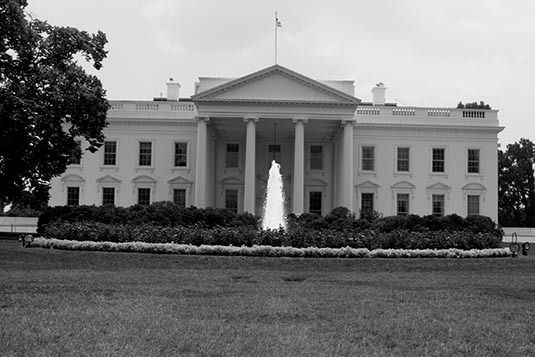 How can a trip to Washington, D.C. be complete without a visit to the White House? Well there’s no stopping to view it from outside. White House was our next stop. During my visit I was intrigued by an old lady in her late 80’s who has made her home with a make-shift tent just across the White House. Well, years ago there was no law to evacuate such squatters. She has been around ever since… protesting against the war. Given her location, I am sure she must be the first person that the US President sees from his window every morning! The Smithsonian Institution is an educational and research institute and associated museum complex, administered and funded by the government of the United States and by funds from its endowment, contributions, and profits from its retail operations, concessions, licensing activities, and magazines. While most of its 19 museums, its zoo, and its 9 research centers facilities are located in Washington, D.C., sites are also located in New York City, Virginia, Panama, and elsewhere. The Smithsonian has over 136 million items in its collections, publishes two magazines named Smithsonian (monthly) and Air & Space (bimonthly), and employs the Smithsonian Police to protect visitors, staff, and the property of its museums. The Smithsonian Institution is the largest museum complex in the world, and many of its buildings are historical and architectural landmarks. In addition, 168 other museums are Smithsonian affiliates. And the best part is the fact that entry to every museum in Washington, D.C., is free of cost. The capital, indeed, is ‘The Destination' for museum & history buffs. With only an afternoon on hand, I ran through 3 museums: National Air & Space Museum; National Gallery of Art; and Museum of American Indian. The National Air and Space Museum (NASM) of the Smithsonian Institution holds the largest collection of historic aircraft and spacecraft in the world. It was established in 1976. It is a center for research into the history and science of aviation and spaceflight, as well as planetary science and terrestrial geology and geophysics. The National Gallery of Art was established in 1937. 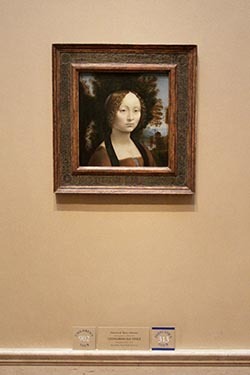 The Gallery's collection of paintings, drawings, prints, photographs, sculpture, medals, and decorative arts traces the development of Western Art from the Middle Ages to the present, including the only painting by Leonardo da Vinci in the Americas. I had the opportunity to see works of art of many masters including Rodin, Rembrandt, Picasso, Van Gogh to name just a few. On display in the main foyer is The Capitoline Venus – a masterpiece from the Capitoline Museum, Rome – sculpted by the Greek Sculptor Praxiteles around 360 BC. Lovers of art can spend days if not months in this museum alone. The National Museum of the American Indian is the first national museum in the country dedicated exclusively to Native Americans. The five-story, 250,000-square-foot curvilinear building is clad in a golden-colored Kasota limestone designed to evoke natural rock formations shaped by wind and water over thousands of years. The museum is set in a 4.25 acres site and is surrounded by simulated wetlands. The National Museum of the American Indian is home to the collection of the former Museum of the American Indian, Heye Foundation. The collection includes more than 800,000 objects, as well as a photographic archive of 125,000 images. 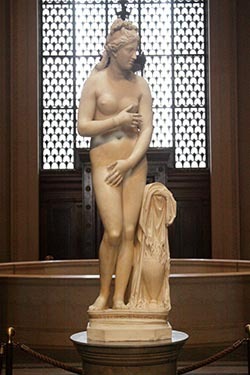 The collection, which became part of the Smithsonian in June 1990, was assembled by George Gustav Heye (1874–1957) during a 54-year period, beginning in 1903. He traveled throughout North and South America collecting Native objects. Whilst there make it a point to visit the museum's multi-media theatre that screens short films on various facets of the Native life. Dinner that night was at Bistro Bistro – a few minutes walk from our hotel. It served French Cuisine… albeit I was not quite impressed. The next morning we would visit Arlington, Virginia. I have featured it separately. In the afternoon, time permitting we would visit the Natural History Museum. The Museum is dedicated to inspiring curiosity, discovery, and learning about the natural world through its unparalleled research, collections, exhibitions, and education outreach programs. Opened in 1910, the green-domed museum on the National Mall was among the first Smithsonian building constructed exclusively to house the national collections and research facilities. 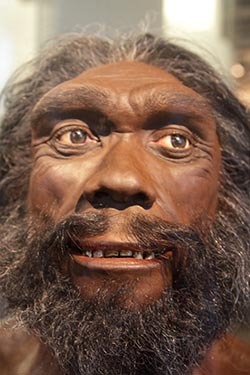 Whether looking at the history and cultures of Africa, describing our earliest Mammalian ancestor or primate diversity around the world, examining ancient life forms including the ever popular dinosaurs, or exploring the beauty of rare gemstones such as uniquely colored diamonds, the Museum’s temporary and permanent exhibitions serve to educate, enlighten and entertain millions of visitors each year. The main building on the National Mall contains 1.5 million square feet of space overall and 325,000 square feet of exhibition and public space; altogether the Museum is the size of 18 football fields, and houses over 1000 employees. Well that was that. It was time to head back to the airport… thus ending an eventful 6 days of touring with Mauiva Aircruise. For me, it was not over yet. The Big Apple was calling.